Venice, one of collector Paul Allen’s favorite cities, is represented in Seeing Nature with scenes of the grand canal, gondolas, and the signature bridges of the Italian city. Among these sumptuous scenes is Canaletto’s The Grand Canal, Venice, Looking South-East from San Stae to the Fabbriche Nuove di Rialto (c. 1738). 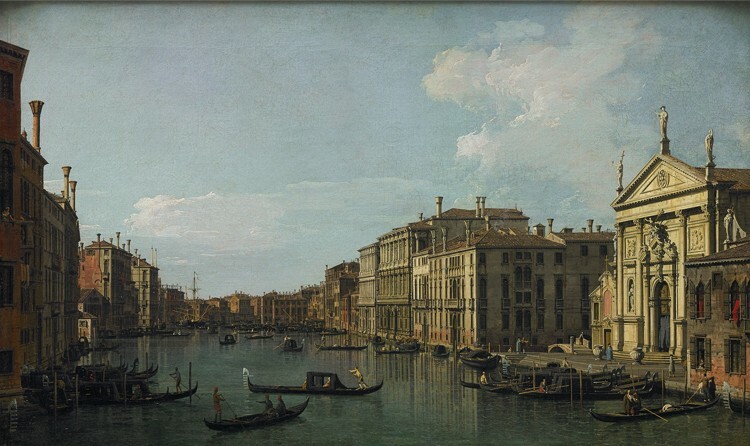 Canaletto mostly made views of famous sites in Venice for tourists, but lesser-known areas often inspired his finest evocations of the unique poetic qualities of his native city. This handsome stretch of the Grand Canal is lined with the stately palaces of great Venetian families and the lovely church of San Stae, designed by Domenico Rossi. The artist exploited the long, straight vista and raking light to create visual drama. His mastery of subtle Venice-specific effects is revealed in the differentiation of still and ruffled water and in the sun-drenched building facades bleeding into their reflections in the canal. Wired magazine has a story on Leo Villareal’s next target for his light art- the San Francisco Bay Bridge. View the dazzling artist rendering below.